Surf & Stay on the tropical island of Nusa Lembongan. The island paradise of Nusa Lembongan is located just off the south east coast of Bali in Indonesia. Take in the jaw-dropping views from our Mojosurf Camp Nusa Lembongan, over looking the many surf breaks of the area. Surf and/or snorkel during the day and then in the evening explore the local village and enjoy some of the many great restaurants and bars. The 3 Day, 2 Night Surf & Stay Nusa Lembongan gives you a taste of our epic surf adventures staying at the tropical island paradise in Indonesia, a ferry ride from Sanur, Bali. Spend 2 nights at Mojosurf Camp Nusa Lembongan overlooking the water and white sandy beaches. Mojosurf will take you to some of the best surfing spots to suit your ability, from beginner friendly waves to punchy waves all within a boat ride of each other. All surf equipment is provided with your Mojosurf Guide with you to seek out the best surf. This surf trip includes a boat trip some of the most highly rated snorkelling in the world with a snorkel safari or Manta Ray snorkel where you will swim alongside these graceful ocean creatures for an experience to remember. This surf trip departs from Sanur, Bali where you will be transferred by fast ferry to the tropical island of Nusa Lembongan. Catch the 9.30am ferry transfer from Sanur (Bali) over to the stunning Nusa Lembongan where our friendly staff will meet you on the beach and show you to our camp just a short walk away. Lunch will be served with a view at our partner restaurant Ware Ware, take in the breath taking views of Mt. Agung and Bali’s east coast skyline. Enjoy your afternoon of relaxing around the pool and exploring the local area. At 4pm we will load into a truck and explore more of the island, ending at Devil’s Tear for an impressive sunset not to be missed. Head back to Mojosurf Camp Nusa Lembongan for a tour of the surf camp before dinner at the rooftop bar overlooking the ocean. Early start today for our snorkel safari around the Nusa islands, departing at 7am*. Our captain will scout out giant manta rays, beautiful coral and the famous Nemo fish. Return back to the accommodation for 9am and get served a yummy breakfast. Next we will hit the waves at the world class breaks of Nusa Lembongan. Times are subject to change with the tides. 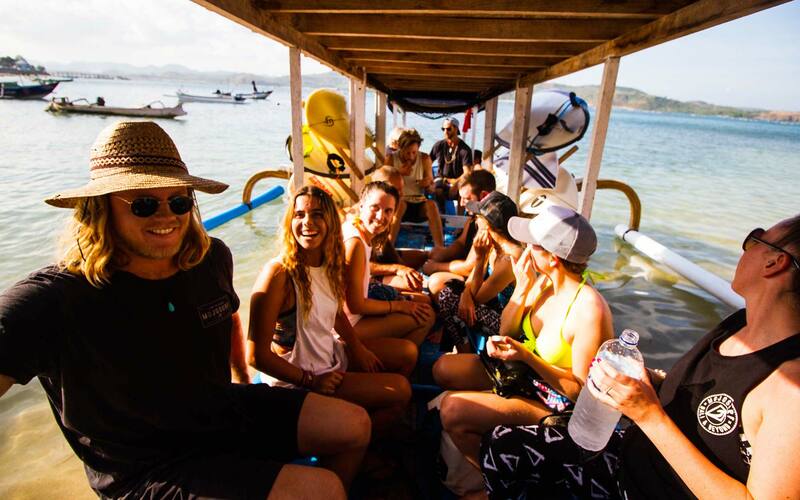 Meet our surf team at the camp who will take you out on the boat for your lesson. Both lunch and dinner will be served at the rooftop bar. End the day enjoying the happy hour watching the sun go down. * Snorkel and surf times are subject to change depending on the tide. Today will be dedicated to soaking up the last of what the island has to offer. We will head out for one last surf to practice what you learnt the day before. The Mojosurf Nusa Lembongan Surf Camp accommodation consists of shared and private rooms all with modern facilities such as air con, western amenities, comfortable beds and spectacular views of crystal clear water and white sandy beaches. Nusa Lembongan offers a variety of restaurants on the water’s edge with a delicious range of both local and western food. The staff at Mojosurf have handpicked the finest restaurants on the island including the best fish BBQ you will ever have, where the fish is so fresh the staff are still wet from spearing it before your arrival! Or you can head to the Mojosurf Camp bar overlooking the water and watch the sunset.